World Migratory Bird Day Event a Great Success ! Conservation » World Migratory Bird Day Event a Great Success ! Close to 200 participants came out to celebrate World Migratory Bird Day (WMBD) events across Vancouver on May 12, 2012. The event was officially launched at the great blue heron colony in Stanley Park where Park Board chair Constance Barnes and past commissioner Loretta Woodcock read the City of Vancouver’s official proclamation of World Migratory Bird Day. A sign recognizing English Bay-Burrard Inlet as a globally designated Important Bird Area (IBA) was officially unveiled. West End MLA Spencer Chandra-Herbert said a few words in support of bird conservation, and George Clulow, a representative of Bird Studies Canada, put the day in context before leading a group of community members on an extensive bird walk through Stanley Park. Bird walks were concurrently held in five parks across the City led by Nature Vancouver and Stanley Park Ecology Society (SPES) bird experts. Volunteers tracked the numbers and species of birds recorded to add to a results display created by City Studio students. There were about 120 people who attended in total and more than 80 species of birds (migratory and resident) were observed. Open Bird House: Public and participants met at the Central Branch of the Vancouver Public Library in the afternoon where displays were set up by a variety of community groups. OWL Raptor Rehabilitation brought a live hawk and owl to show, SPES had a bird feeder making activity, and the Young Naturalist’s Club brought activities for children. The Beatty Biodiversity Museum had taxidermied animals for people to examine, and a giant great blue heron puppet directed passers-by from the library atrium to the event. For those who came inside on such a lovely spring day there were lots of give-aways and good information about birds. The afternoon was rounded out by an engaging presentation by birder Russell Cannings who shared with the group about his record-setting “big birding year” while poking fun at his fellow birders. The day ended with prizes for lucky winners in attendance. 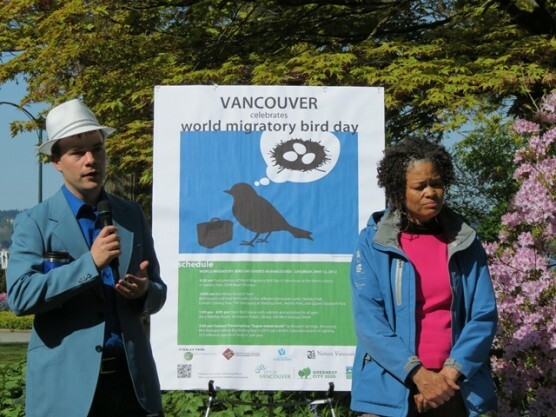 This is the first time a World Migratory Bird Day event such as this has been held in the City and we hope it will grow each year to reach more people and extend farther across the Lower Mainland. 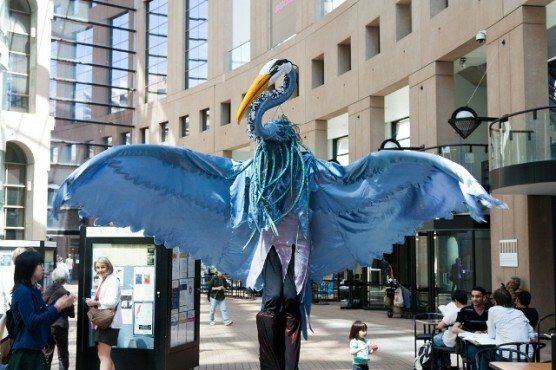 For more info about Vancouver’s World Migratory Bird Day follow the link. For the results of the bird walk counts please go here. WMBD is a United Nations initiative that recognizes the importance of birds as key indicators of the health of our environment. Better management of birds, through initiatives such as Vancouver’s Green Action Plan, will benefit not only the environment but also the citizens of Vancouver. Since Greater Vancouver has some of the world’s most important habitat and over 407 bird species, it is the perfect place to lead the country in honouring WMBD. SPES leads monthly bird walks in Stanley Park on the last Sunday of each month. See Events for more information.